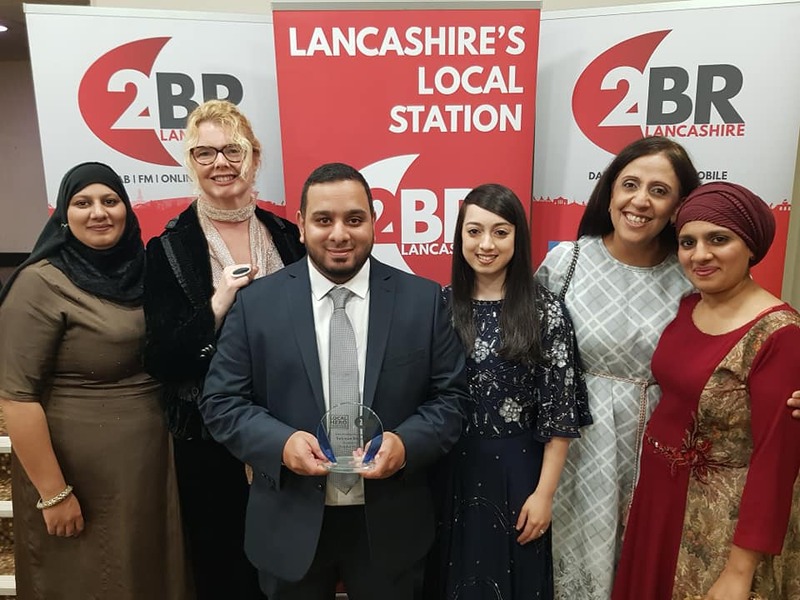 Hospice supporters Caitlin Jones and Suleman Khonat were awarded for their outstanding contributions to their communities at the 2BR Local Heroes Awards. Caitlin Jones, 22, from Darwen, collected the Young Person of the Year Award while Shear Brow councillor Suleman Khonat was awarded the Community Champion Award at the prestigious ceremony held at Burnley’s Mechanics Theatre. The 11 categories aimed to uncover the brilliant and inspirational people of Lancashire. Judges of the community champion award were looking for an individual Lancashire can be proud of and who makes a difference to their community. Suleman, who is also chairman of the North West National Federation of Retail Newsagents and a member of the Connect UK group, has worked tirelessly to raise tens of thousands of pounds for the hospice for the past decade. He said: “The hospice is a fantastic place which needs all our help to keep providing the excellent services. I hope that this award is a catalyst to spread the message of the hospice even further. Sharon Crymble, Fundraising Manager at the hospice, said: “Suleman has been a supporter of the hospice for many years and he is doing a fantastic job of spreading the word about the hospice so that people know it is here if they need it. The Young Person award, which celebrates the good that young people do in our community, went to 22-year-old Caitlin Jones from Darwen. Caitlin has been raising awareness and funds for charities since losing her Dad to lung cancer when she was aged just 12. She channelled all her grief and over the last 10 years has raised almost £30,000. In 2018 Caitlin set herself the target of £10,000 for East Lancashire Hospice to mark the tenth anniversary and has held a series of fundraising events to help reach that target. She has arranged craft events and joined forces with festival organisers among other things. Caitlin said: “I went to the hospice for bereavement after my dad died. Since then, the charity has been really close to my heart. It's like a second family. I don't think I would be in the place I am now if they weren't there.